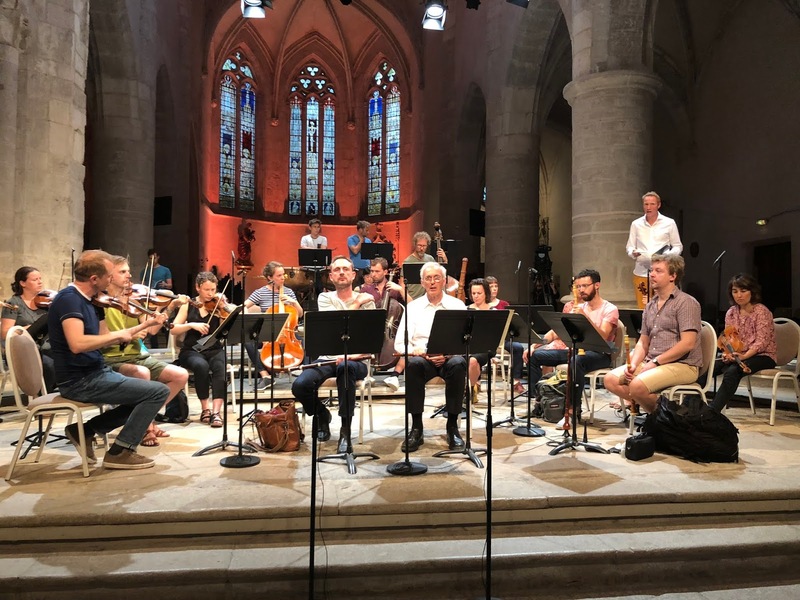 After enjoyable projects over the summer with Vox Luminis in Uzès and at the Utrecht Early Music Festival, it was great to rejoin our friends and colleagues for two more festival appearances on consecutive evenings. 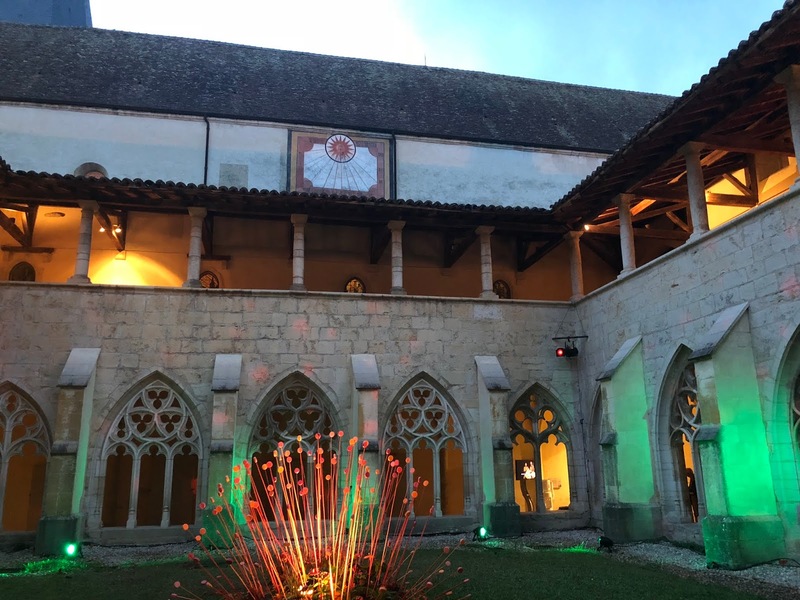 The ensemble performed Handel’s Dixit Dominus [HWV 23] and Bach’s Magnificat [BWV 243] in the Ambronay Festival (Festival D’Ambronay) on Friday 21st September 2018 and in the Ribeauvillé Early Music Festival (Festival de Musique Ancienne de Ribeauvillé) on Saturday 22nd September 2018. 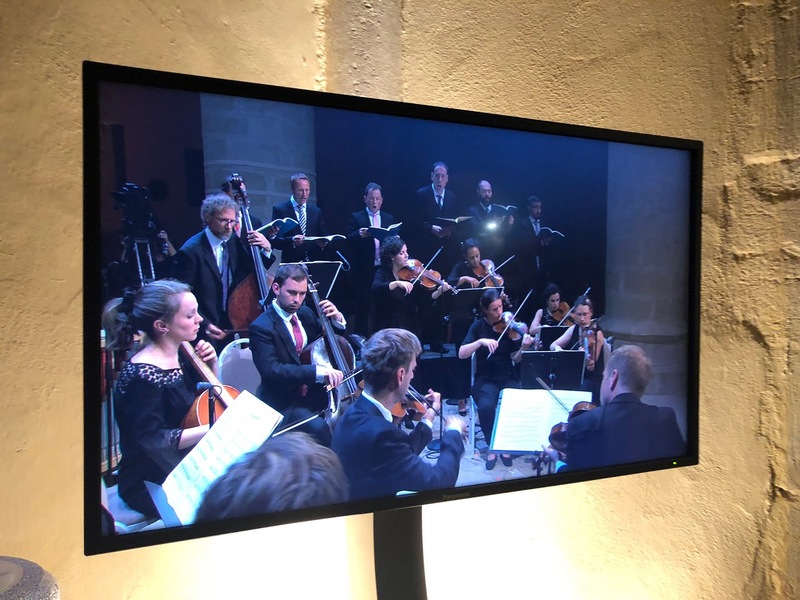 The performance in Ambronay was broadcast live by Culture Box, and the live stream is still available to watch online (as below) or on YouTube. I travelled entirely by rail: first to London St. Pancras, then a Eurostar to Paris, the RER to Gare du Lyon and then via SNCF to Lyon Perrache. From Perrache we walked the short remaining distance over the River Rhône to the rehearsal at the Gymnasium of the Opéra National de Lyon. It was a great feeling to have done it all by rail, despite the cold very early morning start. The United Kingdom’s summer was definitely over and so it was a shock to find summer heat continuing (>32°C in the shade) in France’s third largest city, Lyon. Shortly after we arrived we joined the rehearsal to play the choruses with trumpets and timpani. We played each of these movements three or four times before doing a full run through. The rehearsal studio was fitted with extensive acoustic padding on the walls, making the acoustic very dry - it felt almost like an anechoic chamber! I hadn’t realised how much effort I had been putting into playing. I was somehow trying to fabricate my own reverb, or just trying to make it sound good in there. It was almost impossible, and the process of trying was absolutely knackering. I was tired, hungry and hot and felt quite weak during the run through. I got through it - but I had to play some of it sitting down as I felt quite dizzy. Later, I mentioned to some others in the ensemble that I thought I had not played very well in the rehearsal but nobody seemed to have noticed that I didn’t feel so good - so maybe the problem was more to do with how it felt for me than how it sounded to others. At the end of the rehearsal we had a relaxing evening, with dinner near the hotel. The excellent meal made me feel better and I retired for an early night for some much-needed sleep. The next morning, with me feeling a lot better, we moved our bags to the next hotel which was close to Lyon Part-Dieu station. Having left the bags there, we took a tram into the old town and we were free until about 15:00 to explore. We took the T1 tram to Guillotière and crossed the Rhône on Pont de la Guillotière, walked along Place Bellecour and then went over the Saône on Pont Bonaparte to explore the area around Vieux Lyon. 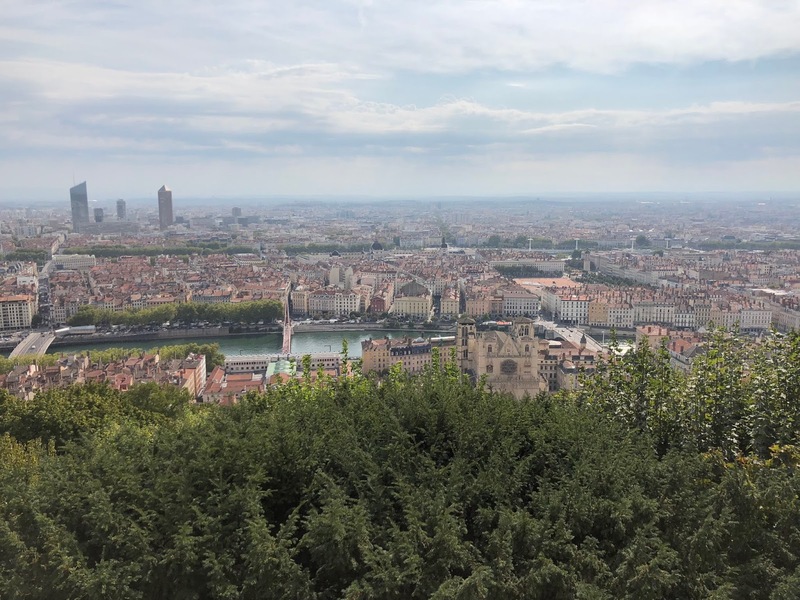 We followed the path to the Basilica of Notre-Dame de Fourvière on a hill to the West of old Lyon. 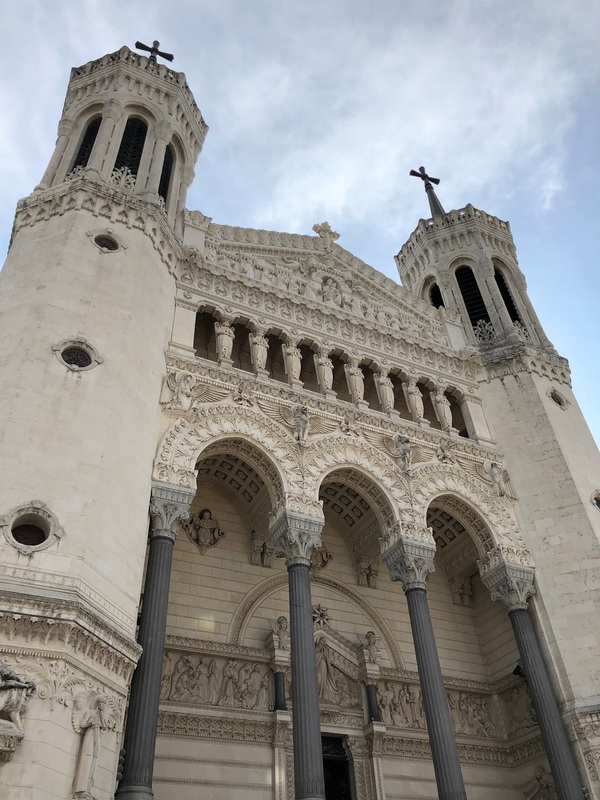 From there there was a magnificent view over Lyon and incredibly intricate stone masonry on the impressive Basilica. After this we explored the streets of the old town and followed our feet - without too much of a plan. We had a relaxed boulangerie-based lunch in Les Cordeliers and looked around the area by the City Hall and Lyon National Opera. Lyon, on the confluence of the two rivers, is a great place to explore. On our walk back to Part-Dieu I stumbled upon the Chapelle de la Trinité. I had played the Christmas Oratorio in there eight years ago, the last time I was in Lyon. I had great memories of that tour and particularly of that concert - which was, in my opinion, the highlight of that tour. 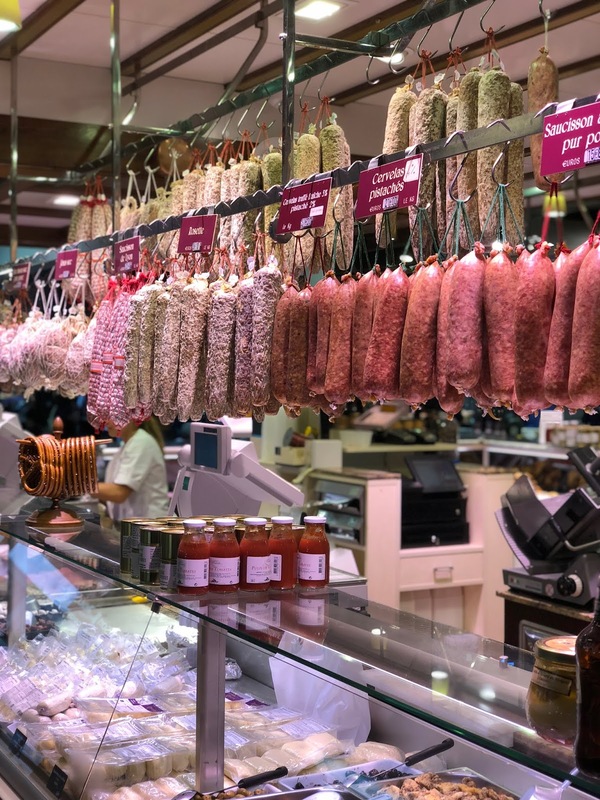 The other lasting memory from my previous visit to Lyon was visiting the unbelievable food hall, so I had to visit Les Halles de Lyon - Paul Bocuse again. 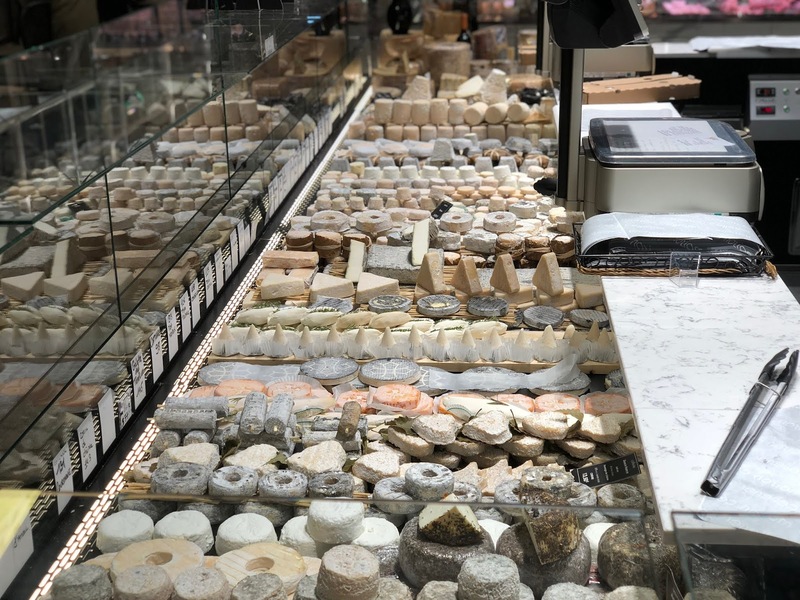 This impressive food hall of 13,000 square metres - endorsed by Paul Bocuse (1926 - 2018), a famous French chef renowned for his innovative, ingredient-centred approach - can surely be called one of France’s gastronomic epicentres. After a great day of exploring we travelled around 60km by coach towards Ambronay (north-east of Lyon) and unfortunately encountered a lot of traffic. 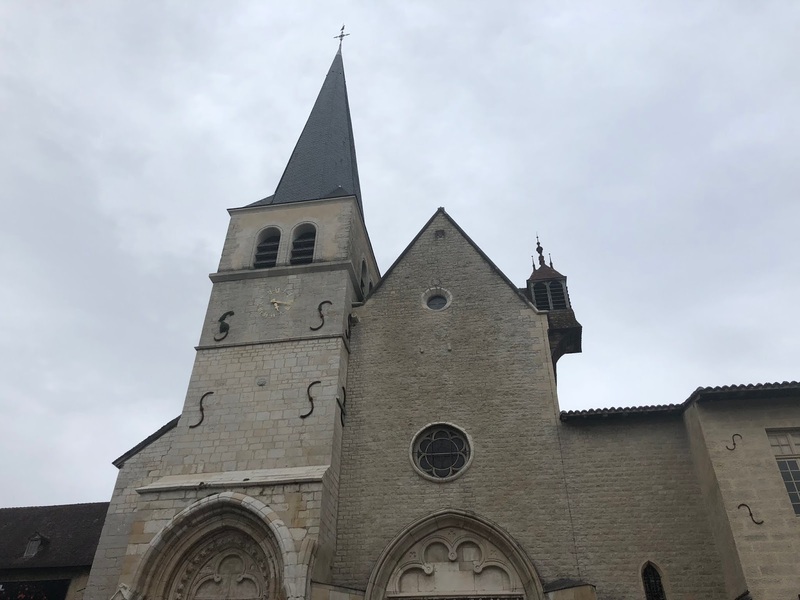 The group’s coach arrived at Ambronay Abbey (Abbaye Notre-Dame d'Ambronay) a little later than planned but with still plenty of time to rehearse in this stunning venue. 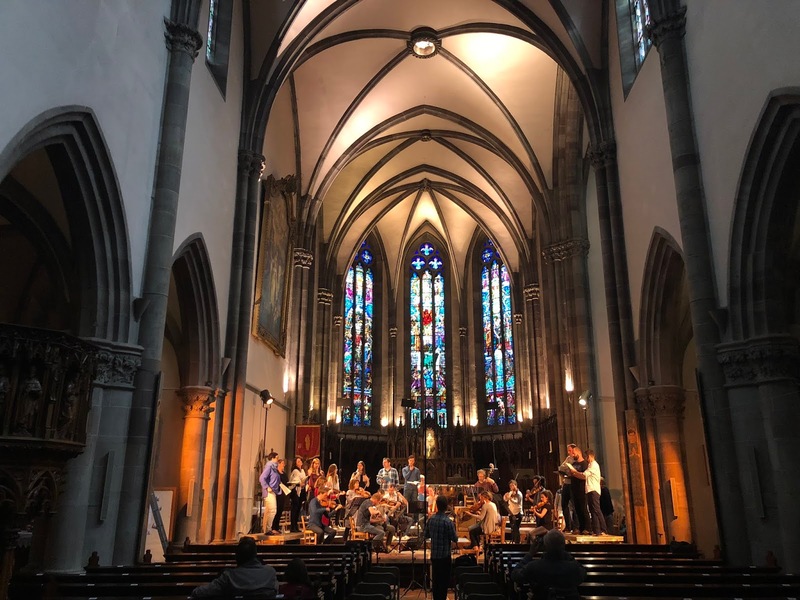 After yesterday’s rehearsal, I had never been so pleased to play in a generous acoustic! Rostrums were manoeuvred and the television crew ensured the lights, microphones and cameras were in place around us, as it was to be broadcast live on television (and online) by Culture Box. After the rehearsal we moved to a dining room for an excellent dinner which had been kindly provided by the festival. Refuelled and ready, we (the trumpet section) listened and watched the first half of the concert (Handel’s Dixit Dominus) on screens situated in the cloisters of the Abbey. We joined Vox Luminis on stage after the interval and played Bach’s Magnificat. The concert was really enjoyable and of a very high standard. After the Magnificat, we gave an encore of Dona Nobis Pacem from the B Minor Mass and a second encore of the Sicut Erat in Principio, the final movement of the Magnificat. Encores begin at 1:11:20 on the YouTube video above. We enjoyed a reception after the concert before returning to Lyon Part-Dieu by coach. 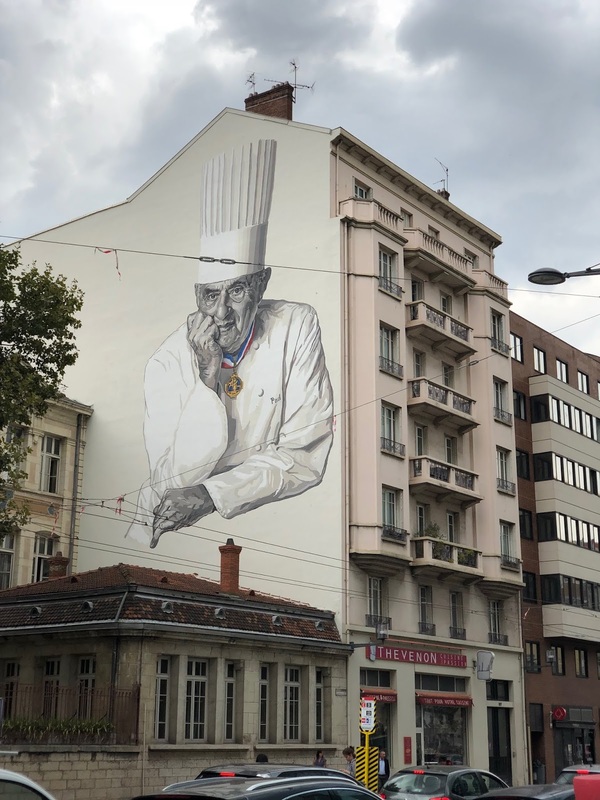 The next morning we departed Lyon for Ribeauvillé in the Alsace region of France. The 380km route flanked the border of Switzerland before finally heading North for the last leg of the journey. 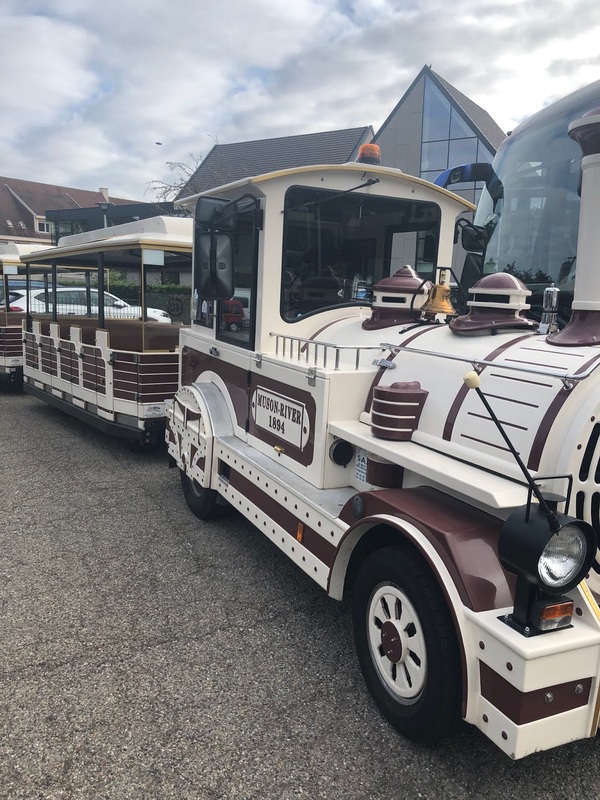 Upon arrival in Ribeauvillé we had to alight in a coach park on the outskirts of the old town and continue our journey in a narrower vehicle. The entire orchestra and choir of Vox Luminis, complete with instruments and luggage, boarded a tourist train! We were driven (almost paraded) uphill through the narrow streets of the old town. Ribeauvillois, tourists and a significant student contingent parted to allow the tourist bus through. They, particularly the students, gave us a warm welcome - with Mexican waves as the tourist train came through the streets. It was quite surreal. After a few minutes we reached the church at the top of the old town where we would give another excellent performance of this programme. It was an excellent tour of two excellent concerts.